This book investigates processes for the prototyping of user interfaces for mobile apps, and describes the development of new concepts and tools that can improve the prototype driven app development in the early stages. It presents the development and evaluation of a new requirements catalogue for prototyping mobile app tools that identifies the most important criteria such tools should meet at different prototype-development stages. This catalogue is not just a good point of orientation for designing new prototyping approaches, but also provides a set of metrics for a comparing the performance of alternative prototyping tools. In addition, the book discusses the development of Blended Prototyping, a new approach for prototyping user interfaces for mobile applications in the early and middle development stages, and presents the results of an evaluation of its performance, showing that it provides a tool for teamwork-oriented, creative prototyping of mobile apps in the early design stages. This book develops valuable new approaches to digital out-of-home media and digital signage in urban environments. It offers solutions for communicating interactive features of digital signage to passers-by. Digital out-of-home media and digital signage screens are becoming increasingly interactive thanks to touch input technology and gesture recognition. To optimize their conversion rate, interactive public displays must 1) attract attention, 2) communicate to passers-by that they are interactive, 3) explain the interaction, and 4) provide a motivation for passers-by to interact. This book highlights solutions to problems 2 and 3 above. The focus is on whole-body interaction, where the positions and orientations of users and their individual body parts are captured by specialized sensors (e.g., depth cameras). The book presents revealing findings from a field study on communicating interactivity, a laboratory on analysing visual attention, a field study on mid-air gestures, and a field study on using mid-air gestures to select items on interactive public displays. In the wake of the smartphone revolution, mobile games have not only become a spare time activity for the majority of phone owners, they have also created a prospering new industry. To thrive in an increasingly stiff competition, both game developers and service providers are seeking to improve their customers’ gaming experience and understand how it is affected by external influences in order to distinguish themselves from their competitors. However, playing experience is the result of a complex interplay of numerous factors: While the game itself sets the stage and determines the rules, look, and sound of the play, its implementation has to adapt to the player’s device properties such as its screen size and available input methods, mobile network degradations, and respond to sudden interruptions such as incoming phone calls or contextual events like the player’s arrival at the right bus stop gracefully. Although subjective effects of many influences have been studied for PC or console-based gaming in the past, this knowledge cannot be applied to mobile games straightforwardly as they differ from their stationary counterparts in various ways: Since smartphones and tablets are multi-purpose devices, they lack gaming-specific controls such as joysticks or game-pads and instead feature touch input which leads to the obstruction of manipulated parts of the screen and conveys no immediate haptic feedback. Consequently, this thesis investigates the subjective effects of variations of the four quality-influencing factors game, device, network, and context in mobile touch-based gaming individually using experimental studies with test participants. Conclusions are then drawn on how each of these factors influences a player’s gaming experience. As common interactive methods for assessing gaming quality are time-consuming and potentially unrealistic due to interruptions incurred by the subjective self-assessments, two additional studies are presented, which explore novel test methodologies. The first investigates the applicability of a standard non-interactive video assessment method for evaluating aspects of gaming quality, whereas the second examines using a physiological measure to obtain quality correlates as a substitute for having to interrupt and ask the player. Finally, this thesis concludes with a discussion of how the found effects of game implementation, device size and network bandwidth affect future subjective gaming studies and considers further directions for research. This book proposes a combination of cognitive modeling with model-based user interface development to tackle the problem of maintaining the usability of applications that target several device types at once (e.g., desktop PC, smart phone, smart TV). Model-based applications provide interesting meta-information about the elements of the user interface (UI) that are accessible through computational introspection. Cognitive user models can capitalize on this meta-information to provide improved predictions of the interaction behavior of future human users of applications under development. In order to achieve this, cognitive processes that link UI properties to usability aspects like effectiveness (user error) and efficiency (task completion time) are established empirically, are explained through cognitive modeling, and are validated in the course of this treatise. In the case of user error, the book develops an extended model of sequential action control based on the Memory for Goals theory and it is confirmed in different behavioral domains and experimental paradigms. This new model of user cognition and behavior is implemented using the MeMo workbench and integrated with the model-based application framework MASP in order to provide automated usability predictions from early software development stages on. Finally, the validity of the resulting integrated system is confirmed by empirical data from a new application, eliciting unexpected behavioral patterns. 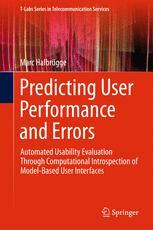 This book describes an extension of the user behaviour simulation (UBS) of an existing tool for automatic usability evaluation (AUE). This extension is based upon a user study with a smart home system. It uses technical-sociological methods for the execution of the study and the analysis of the collected data. A comparison of the resulting UBS with former UBSs, as well as the empirical data, shows that the new simulation approach outperforms the former simulation. The improvement affects the prediction of dialogue metrics that are related to dialogue efficiency and dialogue effectiveness. Furthermore, the book describes a parameter-based data model, as well as a related framework. Both are used to uniformly describe multimodal human-computer interactions and to provide such descriptions for usability evaluations. Finally, the book proposes a new two-stage method for the evaluation of UBSs. The method is based on the computation of a distance measures between two dialogue corpora and the pair-wise comparison of distances among several dialogue corpora. 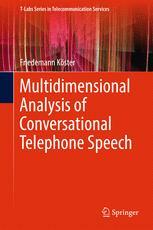 This book presents a new diagnostic information methodology to assess the quality of conversational telephone speech. For this, a conversation is separated into three individual conversational phases (listening, speaking, and interaction), and for each phase corresponding perceptual dimensions are identified. A new analytic test method allows gathering dimension ratings from non-expert test subjects in a direct way. The identification of the perceptual dimensions and the new test method are validated in two sophisticated conversational experiments. The dimension scores gathered with the new test method are used to determine the quality of each conversational phase, and the qualities of the three phases, in turn, are combined for overall conversational quality modeling. The conducted fundamental research forms the basis for the development of a preliminary new instrumental diagnostic conversational quality model. This multidimensional analysis of conversational telephone speech is a major landmark towards deeply analyzing conversational speech quality for diagnosis and optimization of telecommunication systems. This book studies the motivation of crowdworkers to find out how to attract more people and reach a higher quality of outcomes. The book first proposes a taxonomy for studying the motivation of crowdworkers including the potential influencing factors, different types of motivation, and possible consequences and outcomes related to the motivation. Next, the CWMS questionnaire, an instrument for measuring the underlying motivation of crowdworkers is developed. It considers different dimensions of motivation suggested by the Self-Determination Theory of motivation which is a well-established and empirically validated psychological theory used in various domains. This instrument can be used to study the effect of platform and user characteristics on the general motivation of crowdworkers. Later, the task-specific motivation of crowdworkers is studied in detail: Influencing factors are investigated, subjective methods for measuring them are evaluated, a model for predicting worker’s decision on taking a task is proposed, the relative importance of different factors for two populations of crowdworkers is studied, and finally, a model for predicting the expected workload (as one of the major influencing factors) given the task design is proposed. Smartphones have become indispensable in the life of many people. They are constant companions, connections to the world, information sources, and substitutes for other devices and tools that had to be carried individually in the past. While smartphones offer a variety of sources for positive user experience, their downside is their vulnerability to security attacks and the potential they offer to harm a users’ privacy. However, due to their known vulnerabilities, smartphones also encompass a number of mechanisms to protect a user’s security and privacy. 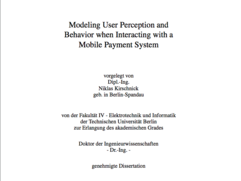 This thesis focuses especially on security and privacy mechanisms which are visible to the end-user and which involve actions by the end-user, such as app permissions and screen locks with authentication. Research on the human factors related to mobile security and privacy mechanisms often follows the usable security and privacy paradigm. Thereby, usability forms the basis of understanding and improving the interaction between humans and security systems. An extension of the usability paradigm is the user experience (UX) paradigm which considers interaction factors beyond usability such as motivation, affect and emotion, and joy of use. The present thesis extends the body of knowledge on human factors and mobile security and privacy mechanisms by taking a user experience approach to the topic. It first investigates users’ experiences with and motivations to use mobile security and privacy in several qualitative, explorative studies. The findings thereof suggest that users not only suffer from limited usability of mobile security and privacy mechanisms, but that such mechanisms also need to address non-functional product qualities (e.g. hedonic quality) and the fulfillment of psychological needs. Those needs do not necessarily have to be related to the psychological need of Security only, but can also encompass aspects such as Autonomy and Stimulation. By the help of two use cases – app permissions and screen locks with authentication – several quantitative studies evaluate the potential of these mechanisms to shape the user experience in general and in particular with respect to hedonic quality. The results of the quantitative studies suggest that usability is an important factor for a good user experience with mobile security and privacy mechanisms. Furthermore, the results indicate that also these kinds of mechanisms can be manipulated in their potential to address aspects such as hedonic quality and need fulfillment. This suggests an extended design space for mobile security and privacy mechanisms which provides system designers with new possibilities to design secure systems that enable positive experiences. Based on these findings, directions for future research are discussed. Smartphones sind im Leben vieler Menschen unabkömmlich geworden – sie sind ständige Begleiter, Verbindung in die Welt, Informationsquellen und zu guter Letzt ein Ersatz für viele Geräte oder Werkzeuge, die man in der Vergangenheit einzeln mit sich tragen musste. Obwohl Smartphones eine Vielzahl an positiven Erlebnissen bieten können, leiden sie unter der Einschränkung, dass sie verwundbar gegenüber Angriffen auf die Sicherheit und Privatsphäre der Nutzer sind. Aus diesem Grund beinhalten Smartphones jedoch eine Reihe von Mechanismen zum Schutz gegen selbige. Die vorliegende Dissertation beschäftigt sich mit der Anwendung solcher Mechanismen und dabei speziell mit den Mechanismen, die vom Endnutzer wahrgenommen und eingesetzt werden können, wie zum Bespiel App-Berechtigungen und Bildschirmsperren mit Authentifizierung. Die Erforschung menschlicher Einflussfaktoren in Bezug auf die Nutzung mobiler Sicherheits- und Privatsphäremechanismen folgt oft dem Paradigma der “Usable Security and Privacy”. In diesem Paradigma ist die Gebrauchstauglichkeit der Kernfaktor um Interaktionen mit mobilen Sicherheits- und Privatsphäremechanismen zu verstehen und zu verbessern. Eine Erweiterung des Gebrauchstauglichkeitsparadigmas ist das Nutzererlebnisparadigma (engl. User Experience (UX)), das Interaktionsaspekte berücksichtigt, die über die Gebrauchstauglichkeit hinausgehen, wie z.B. Motivation, Affekt und Emotion, oder auch Spaß bei der Nutzung. 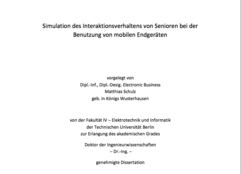 Die vorliegende Dissertation erweitert den Kenntnisstand zu menschlichen Einflussfaktoren bei der Interaktion mit mobilen Sicherheits- und Privatsphäremechanismen, indem sie einen Nutzererlebnis-basierten Ansatz zur Erforschung des Themengebiets aufgreift. Dabei werden zuerst Nutzererlebnisse mit und Motivatoren für die Nutzung mobiler Sicherheits- und Privatsphäremechanismen in qualitativen Studien erforscht. Die Ergebisse dieser Studien deuten darauf hin, dass Nutzer nicht nur unter der eingeschränkten Gebrauchstauglichkeit solcher Systeme leiden, sondern, dass auch Bedarf besteht, nicht-funktionale Produktqualitäten (wie z.B. hedonische Qualität) und die Erfüllung von psychologischen Bedürfnissen mit solchen Mechanismen anzusprechen. Diese Bedürfnisse müssen sich nicht allein am psychologischen Bedürfnis nach Sicherheit ausrichten, sondern können auch andere Bedürfnisse wie zum Beispiel das Bedürfnis nach Autonomie und Stimulation einschließen. Anhand zweier Fallbeispiele – App-Berechtigungen und Bildschirmsperren mit Authentifizierung – wird in mehreren quantitativen Studien das Potenzial dieser Mechanismen, das Benutzererlebnis im Allgemein und im Besonderen in Bezug auf hedonische Qualitäten zu formen, evaluiert. Die Ergebnisse der quantitativen Studien lassen darauf schließen, dass Gebrauchstauglichkeit ein wichtiger Faktor für das Benutzererlebnis mit solchen Mechanismen ist. Darüber hinaus zeigen die Ergebnisse, dass auch solche Arten von Mechanismen in ihrem Potenzial, Aspekte wie hedonische Qualität und Bedürfniserfüllung anzusprechen, manipuliert werden können. Dies eröffnet einen erweiterten Gestaltungsraum für mobile Sicherheits- und Privatsphäremechanismen, der Systemdesignern neue Möglichkeiten bietet sichere Systeme, deren Benutzung ein positives Benutzererlebnis hervorruft, zu gestalten. Basierend auf diesen Ergebnissen werden Richtungen für zukünftige Forschung aufgezeigt. 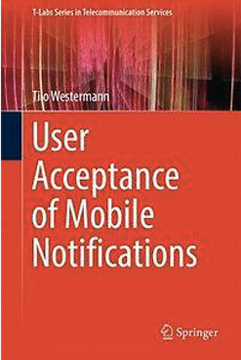 This book presents an alternative approach to studying smartphone-app user notifications. It starts with insights into user acceptance of mobile notifications in order to provide tools to support users in managing these. It extends previous research by investigating factors that influence users’ perception of notifications and proposes tools addressing the shortcomings of current systems. It presents a technical framework and testbed as an approach for evaluating the usage of mobile applications and notifications, and then discusses a series of studies based on this framework that investigate factors influencing users’ perceptions of mobile notifications. Lastly, a set of design guidelines for the usage of mobile notifications is derived that can be employed to support users in handling notifications on smartphones. Text-to-Speech (TTS) synthesis, i.e., artificially produced speech, has finally attained a quality level that makes it possible to include it into ordinary services that are used by common people. With the increasing processing power of smartphones and the development of intelligent personal assistants like Siri, Cortana, and Google Now, synthetic speech started to affect even more people. Therefore, within the past couple of years, TTS has made its way from a geeky accessory to a normal part of everyday life. Nonetheless, modern TTS systems still suffer from diverse quality con- straints: frequent concatenations and temporal manipulations in diphone syn- thesis cause discontinuous speech, HMM synthesis can lead to natural sound- ing but also very buzzy and muffled speech, and the quality of unit selection voices not only depends on the degree of the fit, but also on the appropriate- ness of the available speech units. Therefore, the resulting impairments all yield different perceptual impressions. Thus, the quality of synthetic speech is of multidimensional nature. Therefore, research towards perceptual quality dimensions of synthetic speech is reviewed and two experiments towards perceptual quality are con- ducted. Their findings are compared with the state of the art and a set of five perceptual quality dimensions is derived. They are: (i) naturalness of voice, (ii) prosodic quality, (iii) fluency and intelligibility, (iv) absence of disturbances, and (v) calmness. Moreover, a test protocol is designed that recommends an experimental setup to assess these five dimensions. In addition, several factors that influence these dimensions are analyzed. First, the findings of two studies show that the relevance of these dimensions shift depending on the use case (short messages readers vs. synthesized au- diobooks). Second, a significant effect of a speaker’s voice of a speech corpus is verified for all dimensions. And third, it is shown that the size of the speech corpus for unit selection voices significantly affects all dimensions. Furthermore, different approaches towards instrumental quality assess- ment of synthetic speech are examined. Two linear regression models are developed and employed to estimate the quality of TTS signals. Even though they reach correlations between estimated score and auditory rating of up to .74, they are outperformed by two more complex, non-linear approaches. One of these non-linear measures is utilized with the aim to improve the quality of MaryTTS unit selection voices. Even though this goal could not be achieved, the study highlights different approaches to further improve the prediction accuracy and therefore also the quality of the generated voice. Telecommunication services have to cope with degradations resulting from the necessary transmission of data. A telecommunication service might thus not always be able to provide the same performance to a user. The resulting variation in perceived quality might affect the user’s satisfaction, attitude, behavior, and also future-use intention towards a telecommunication service. 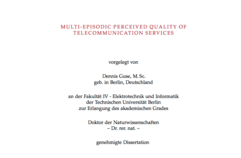 This thesis investigates the formation process of perceived quality across multiple, distinct interactions with one telecommunication service. The formation process of the so-called multi-episodic perceived quality is examined for two different time spans. Here, repeated-use in one session consisting of multiple usage episodes is investigated with an overall duration of up to 45 min. This is complemented by studying the formation process spanning several days. This investigation was conducted by performing empirical experiments under controlled laboratory settings as well as field experiments. These experiments are based upon the Mean Opinion Score (MOS), i. e., the assessment of the perceived quality of an (almost) identical stimulus/condition by multiple observers to derive the judgment of an average observer. The impact of individual user behavior was limited here by defining the task, content, and also time for each usage episode as well as the provided performance (defined-use method). The empirical data shows that applying the defined-use method is feasible and yields consistent results. The results of the experiments show that more recent episodes have a higher impact on the multi-episodic perceived quality (recency effect). A saturation is observed for consecutive degraded episodes, i. e., the multi-episodic judgments remain on the same level above the episodic judgments of degraded episodes. In addition, a duration neglect is observed, i. e., a longer degraded episode does not have a higher negative impact on judgments of multi-episodic perceived quality. With the empirical data, models for the prediction of multi-episodic judgments are evaluated. These models are based on the weighted average of the episodic judgments. The evaluation showed that a linear function outperforms a window function in regard to prediction accuracy and robustness. Sicherheitsrelevante elektronische Systeme wie Computer, Smartphones, elektronische Zugangssysteme und eBanking betreffen heute unser ganzes Leben. Deshalb werden diese Systeme heute nicht nur von professionellen, sondern auch gewöhnlichen, Anwendern benutzt und beide müssen sie korrekt benutzen, um ihre eigene Sicherheit nicht zu gefährden. Daraus folgt, dass diese Systeme nicht nur sicher, sondern auch benutzbar sein müssen, und das Systemdesign die Herausforderung erfüllen muss, eine Balance zwischen Sicherheit und Benutzbarkeit zu finden. In der Forschung zur Benutzbarkeit von Sicherheitssystemen (usable security) herrscht Einigkeit, dass beide Eigenschaften meist entgegengesetzt wirken: mehr Sicherheit führt oft zu weniger Benutzbarkeit und umgekehrt. Deshalb ist es wichtig zu verstehen, welche Faktoren die Nutzerwahrnehmung in Bezug auf Sicherheit und Benutzbarkeit und welche Faktoren die Entscheidung, ein solches System zu benutzen, beeinflussen. Mit diesem Wissen können sicherere und gleichzeitig besser benutzbare Systeme entwickelt werden. Die Formalisierung dieses Wissens in Form von Modellen, die während des Entwicklungsprozesses benutzt werden (idealerweise unter Beachtung des Usability Engineering Lifecycles), kann helfen, Kosten zu senken und bessere (also sichere und benutzbare) Produkte zu entwickeln. Mit dieser Arbeit liefert der Autor eine Grundlage, um die Nutzer von sicherheitsrelevanten elektronischen Systemen zu verstehen. Als erstes wurde eine theoretische Analyse des Nutzers und möglicher Einflussfaktoren auf seine Wahrnehmung von und sein Nutzungsverhalten im Umgang mit diesen Systemen durchgeführt. Das gesammelte Wissen floss in eine Taxonomie dieser Faktoren und von dieser wurde ein theoretisches Modell abgeleitet. Um das theoretische Modell mit Daten zu füllen, wurde eine Evaluationsmethode, bestehend aus einem Fragebogen und einem Experimentalaufbau, entwickelt. Damit wurden fünf Experimente mit insgesamt 88 Versuchsteilnehmern durchgeführt. Nach jedem Experiment wurden der Fragebogen und der Experimentalaufbau überprüft und gegebenenfalls angepasst. Mit den Daten aus den Experimenten wurden statistische Modelle berechnet, um signifikant einflussreiche Faktoren zu identifizieren. Des Weiteren wurde das theoretische Modell während des Modellierungsprozesses auf Grundlage der Resultate angepasst. Zuletzt wurde die Evaluationsmethode überarbeitet, um die Ergebnisse der Modellierung und die gefunden Einflussfaktoren widerzuspiegeln. Zusammenfassend steuert diese Arbeit eine Taxonomie potentieller Einflussfaktoren auf Nutzerwahrnehmung und -verhalten, eine empirische Evaluationsmethode, bestehend aus einem Fragebogen und einem Experimentalaufbau, zwei Modelle der Nutzerwahrnehmung und ein Modell des Nutzerverhaltens zum Forschungsfeld usable security bei. Die in dieser Arbeit identifizierten signifikanten Einflussfaktoren sind zum einen Persönlichkeitsmerkmale (Offenheit, Gewissenhaftigkeit, positive Einstellung) und den Dienst betreffende Eigenschaften (wahrgenommene Gebrauchstauglichkeit, wahrgenommene Sicherheit, kategorialer Preis, Dienstanbieter und wahrgenommene Größe eines finanziellen Schadens). Diese Dissertation ist auf Deutsch verfasst. In this work the following three basic research questions are discussed: (1) can significant effects of modality efficiency and input performance on the selection of input modalities in multimodal HCI be disclosed by unified experimental investigations? (2) Can a utility-driven computational model of modality selection be formed based on empirical data? (3) Can the compiled model for modality selection be utilized for the practical application in the field of automated usability evaluation? Initially, foundations of decision-making in multimodal HCI are discussed, and the state of the art in automatic usability evaluation (AUE) is described. It is shown that there are currently no uniform empirical results on factors influencing modality choice that allow for the creation of a computational model. As part of this work two AUE tools, the MeMo workbench and CogTool, are extended by a newly created computational model for the simulation of multimodal HCI. Aiming at answering the first research question, the empirical part of the thesis describes three experiments with a mobile application integrating touch screen and speech input. In summary the results indicate that modality efficiency and input performance are important moderators of modality choice. The second research question is answered by the derivation of a utility-driven model for input modality choice in multimodal HCI based on the empirical data. The model provides probability estimations of modality usage, based on different levels of the parameters modality efficiency and input performance. Four variants of the model that differ in training data are tested. The analysis reveals a considerable fit for models based on averaged modality usage data. Answering the third research question it is illustrated how the modality choice model can be deployed within AUE tools for simulating multimodal interaction. The multimodal extension as well as the practical utilization of MeMo is depicted, and it is described how unimodal CogTool models of touch screen and speech based interaction can be rendered into multimodal models. A comparison of data generated by simulations with the AUE tools with predictions of the derived modality selection algorithm verifies the correct integration of the model into the tools. The practical application discloses the usefulness of the modality choice model for the prediction of the number of steps and the total time spent to solve specific tasks with multimodal systems. The practical part is concluded by a comparison of Memo and CogTool. Both tools are classified, and an assessment on a subjective basis as well as on the the basis of the quality of predictions is conducted. This work addresses the evaluation of the human and the automatic speaker recognition performances under different channel distortions caused by bandwidth limitation, codecs, and electro-acoustic user interfaces, among other impairments. Its main contribution is the demonstration of the benefits of communication channels of extended bandwidth, together with an insight into how speaker-specific characteristics of speech are preserved through different transmissions. It provides sufficient motivation for considering speaker recognition as a criterion for the migration from narrowband to enhanced bandwidths, such as wideband and super-wideband. Das Ziel dieser Arbeit ist es, eine bestehende Software zur Automatischen Usability Evaluierung (AUE) dahingehend zu erweitern, dass demografische Verteilungen über Einschränkungen in der älteren Bevölkerung in den Simulationsprozess einfließen und Auswirkungen von fehlenden oder unpassenden mentalen Modellen des Eingabegerätes simuliert werden können. Die vorliegende Arbeit dokumentiert den aktuellen Stand der Forschung, die durchgeführten empirischen Versuche zur Modellbildung bzw. Validierung der Modelle und die Weiterentwicklung der Software. Wie in dieser Arbeit gezeigt wird, haben ältere Menschen verschiedene Einschränkungen (Wahrnehmung, Kognition und Motorik), die die Interaktion mit einem System negativ beeinflussen können. Es existieren verschiedene Methoden und Werkzeuge, die es ermöglichen Usability-Fehler durch Simulation zu finden, allerdings haben die Methoden und Werkzeuge offene Probleme, die die Anwendbarkeit limitieren. So wird nicht betrachtet, ob die Personen mit dem Eingabegerät zurechtkommen. Weiterhin werden nur wenige oder keine demografischen Daten verwendet, die eine Abschätzung der Schwere eines Usability-Problems ermöglichen könnten. Um die demografischen Verteilungen von Einschränkungen in die AUE integrieren zu können, wird eine technische Lösung beschrieben, die es ermöglicht Nutzermodelle zu generieren, die realistische Einschränkungen haben. Durch die Reproduktion der Verteilungen von Einschränkungen in der Gesellschaft ist es möglich die Schwere eines Usability-Problems abzuschätzen. Zur Integration von unpassenden und fehlenden mentalen Modellen von Eingabegeräten in die Simulation wurden zwei Versuche durchgeführt. Der erste Versuch diente der Modellbildung und der zweite Versuch der Validierung der Modelle durch einen unabhängigen Test. Die Ergebnisse beide Versuche werden in dieser Arbeit dargestellt. Durch die korrekte Reproduktion von Einschränkungen in der Gesellschaft und durch die beispielhafte Einbindung von mentalen Modellen bezüglich von Eingabegeräten, kann die Qualität von Simulationen substanziell gesteigert werden. Die in dieser Arbeit vorgestellten Ergebnisse erweitern den aktuellen Stand der Forschung und ermöglichen eine vielseitige Weiternutzung. 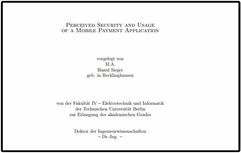 This work presents a comprehensive experimental study of users’ perceived security and frequency of use of a smartphone-based mobile payment app. Previous research work relied primarily on surveys to collect data of potential users’ expectations of and attitude towards mobile payment. It remained sketchy how users would react using a real app, and how mobile payment would be used in comparison with existing payment methods such as cash and payment cards. The design of the experiments was based on a generalizable taxonomy built for the purpose of use within the field of usable security. Five sets of experiments were conducted in which participants took part in a shopping experience. The security method used with the mobile payment app was varied (no security, PIN, fingerprint recognition) and "attacks" were simulated on the payment methods. Furthermore, important personality traits were determined by established questionnaires. The results of the experiments revealed relevant factors, which show an impact on perceived security and usage. It could be shown to what extent personality traits and other external factors are related to perceived security and usage. Additionally, perceived security and usage were modeled and two classificators were developed to distinguish between convenient and inconvenient security methods (for usage), and apps with and without security methods (for perceived security). Finally, the models were incorporated as a proof-of-concept into the tool MeMo for the simulation of user behavior. Overall, it was shown that personality traits have a moderate effect on perceived security and usage. Price, shopping environment, and attacks are also influential. Different security methods showed significant differences in evaluation and use of the app. 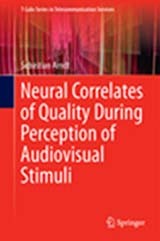 This book presents a new approach to examining the perceived quality of audiovisual sequences. It uses electroencephalography (EEG) to explain in detail how user quality judgments are formed within a test participant, and what the physiological implications might be when subjects are exposed to lower quality media. The book redefines the experimental paradigms of using EEG in the area of quality assessment so that they better suit the requirements of standard subjective quality testing, and presents experimental protocols and stimuli that have been adjusted accordingly. 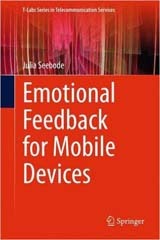 This book investigates the functional adequacy as well as the affective impression made by feedback messages on mobile devices. It presents an easily adoptable experimental setup to examine context effects on various feedback messages and applies it to auditory, tactile and auditory-tactile feedback messages. This approach provides insights into the relationship between the affective impression and functional applicability of these messages as well as an understanding of the influence of unimodal components on the perception of multimodal feedback messages. The developed paradigm can also be extended to investigate other aspects of context and used to investigate feedback messages in modalities other than those presented. The book uses questionnaires implemented on a Smartphone, which can easily be adopted for field studies to broaden the scope even wider. Finally, the book offers guidelines for the design of system feedback. This book interconnects two essential disciplines to study the perception of speech: Neuroscience and Quality of Experience, which to date have rarely been used together for the purposes of research on speech quality perception. In five key experiments, the book demonstrates the application of standard clinical methods in neurophysiology on the one hand and of methods used in fields of research concerned with speech quality perception on the other. 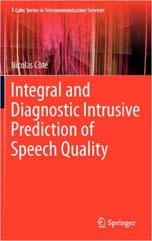 Using this combination, the book shows that speech stimuli with different lengths and different quality impairments are accompanied by physiological reactions related to quality variations, e.g., a positive peak in an event-related potential. Furthermore, it demonstrates that – in most cases – quality impairment intensity has an impact on the intensity of physiological reactions. This book presents guidelines for a future device type: a tablet that allows ergonomic front- and back-of-device interaction. These guidelines help designers and developers of user interfaces to build ergonomic applications for tablet devices, in particular for devices that enable back-of-device interaction. In addition, manufacturers of tablet devices obtain arguments that back-of-device interaction is a promising extension of the interaction design space and results in increased input capabilities, enriched design possibilities, and proven usability. The guidelines are derived from empirical studies and developed to fit the users’ skills to the way the novel device type is held. 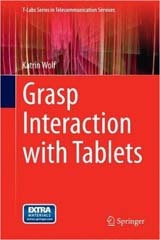 Three particular research areas that are relevant to develop design guidelines for tablet interaction are investigated: ergonomic gestures, interaction areas, and pointing techniques. The work presented in this book focuses on modeling audiovisual quality as perceived by the users of IP-based solutions for video communication like video-telephony. It also extends the current framework for the parametric prediction of audiovisual call quality. 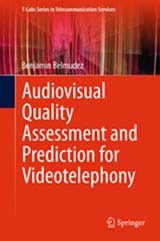 The book addresses several aspects related to the quality perception of entire video calls, namely, the quality estimation of the single audio and video modalities in an interactive context, the audiovisual quality integration of these modalities and the temporal pooling of short sample-based quality scores to account for the perceptual quality impact of time-varying degradations. This book treats the topic of extending the adaptive filtering theory in the context of massive multichannel systems by taking into account a priori knowledge of the underlying system or signal. The starting point is exploiting the sparseness in acoustic multichannel system in order to solve the non-uniqueness problem with an efficient algorithm for adaptive filtering that does not require any modification of the loudspeaker signals. neuroticism. 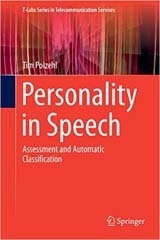 Based on a database built on the questionnaire, the book presents models to tell apart different personality types or classes from speech automatically. 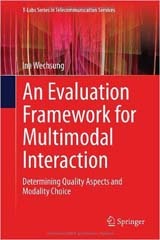 This book presents (1) an exhaustive and empirically validated taxonomy of quality aspects of multimodal interaction as well as respective measurement methods, (2) a validated questionnaire specifically tailored to the evaluation of multimodal systems and covering most of the taxonomy‘s quality aspects, (3) insights on how the quality perceptions of multimodal systems relate to the quality perceptions of its individual components, (4) a set of empirically tested factors which influence modality choice, and (5) models regarding the relationship of the perceived quality of a modality and the actual usage of a modality. 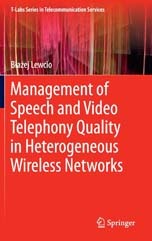 This book shows how networking research and quality engineering can be combined to successfully manage the transmission quality when speech and video telephony is delivered in heterogeneous wireless networks. Nomadic use of services requires intelligent management of ongoing transmission, and to make the best of available resources many fundamental trade-offs must be considered. Network coverage versus throughput and reliability of a connection is one key aspect, efficiency versus robustness of signal compression is another. However, to successfully manage services, user-perceived Quality of Experience (QoE) in heterogeneous networks must be known, and the perception of quality changes must be understood. These issues are addressed in this book, in particular focusing on the perception of quality changes due to switching between diverse networks, speech and video codecs, and encoding bit rates during active calls. 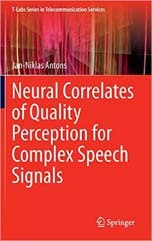 In this book, speech transmission quality is modeled on the basis of perceptual dimensions. The author identifies those dimensions that are relevant for today's public-switched and packet-based telecommunication systems, regarding the complete transmission path from the mouth of the speaker to the ear of the listener. Both narrowband (300-3400 Hz) as well as wideband (50-7000 Hz) speech transmission is taken into account. A new analytical assessment method is presented that allows the dimensions to be rated by non-expert listeners in a direct way. Due to the efficiency of the test method, a relatively large number of stimuli can be assessed in auditory tests. The test method is applied in two auditory experiments. The book gives the evidence that this test method provides meaningful and reliable results. The resulting dimension scores together with respective overall quality ratings form the basis for a new parametric model for the quality estimation of transmitted speech based on the perceptual dimensions. In a two-step model approach, instrumental dimension models estimate dimension impairment factors in a first step. The resulting dimension estimates are combined by a Euclidean integration function in a second step in order to provide an estimate of the total impairment. Drivers tend to glance at the display of in-car infotainment systems despite the presence of speech output. The SEEV Model by Wickens et al. (2003) defines parameters influencing attention allocation towards events in dynamic environments. Analysing the SEEV Model provides insights on which of the parameters of the SEEV Model speech output has disadvantages compared to visual output. In two driving simulator experiments, it was tested whether increasing or decreasing the deducted parameters of the SEEV Model for speech output by means of improving the speech output in various respects actually decreases attention allocation to the display. It was shown that increasing the relevant information content (corresponding to the parameters expectancy and value) for speech as well as decreasing the time effort (which corresponds to the parameter effort) of speech compared to a baseline condition leads towards lower percentage dwell time to the display. Next, it was shown that a conscious motor action performed to request for speech output (corresponding to the parameter effort) decreases attention allocation towards the display in situations whereby the secondary task gets interrupted by a highly demanding driving task. 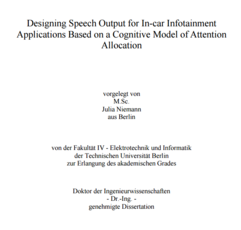 Based on theses insights, design recommendations for speech output were deducted and implemented in a prototype with several infotainment applications. In another driving simulator experiment, it was observed that the design recommendations actually reduced attention allocation towards the display compared to a common speech output design of in-car infotainment systems. The design recommendations to reduce the time effort of speech output were again evaluated regarding their influence on the development of users’ mental models. Finally, it was tested whether increasing the hedonic quality of speech output also leads towards less time glancing at the display. On the one hand, the conducted experiments showed which parameters of the SEEV Model could be influenced for speech output to decrease attention allocation to the display of a multimodal in-car infotainment system. On the other hand, the results provided insights regarding the applicability of specific SEEV Model parameters to the auditory modality since so far the model had only been evaluated with respect to the visual modality. Finally, it was shown that also hedonic aspects of speech output do indeed influence attention allocation. This book systematically addresses the quantification of quality aspects of multimodal interactive systems. The conceptual structure is based on a schematic view on human-computer interaction where the user interacts with the system and perceives it via input and output interfaces. Thus, aspects of multimodal interaction are analyzed first, followed by a discussion of the evaluation of output and input and concluding with a view on the evaluation of a complete system. Spoken dialog systems have the potential to offer highly intuitive user interfaces, as they allow systems to be controlled using natural language. However, the complexity inherent in natural language dialogs means that careful testing of the system must be carried out from the very beginning of the design process. 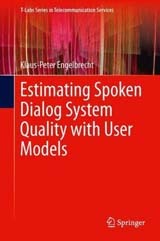 This book examines how user models can be used to support such early evaluations in two ways: by running simulations of dialogs, and by estimating the quality judgments of users. 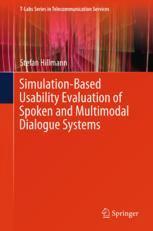 First, a design environment supporting the creation of dialog flows, the simulation of dialogs, and the analysis of the simulated data is proposed. How the quality of user simulations may be quantified with respect to their suitability for both formative and summative evaluation is then discussed. The remainder of the book is dedicated to the problem of predicting quality judgments of users based on interaction data. New modeling approaches are presented, which process the dialogs as sequences, and which allow knowledge about the judgment behavior of users to be incorporated into predictions. All proposed methods are validated with example evaluation studies. 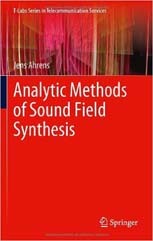 This chapter presents a number of analytic solutions to the problem of sound field synthesis in three and 2.5 dimensions, whereby continuous distributions of secondary sources are assumed. A focus lies on the explicit solution of the synthesis equation, which provides a perfect solution for enclosing secondary source distributions. The explicit solution is derived for spherical, circular, planar, and linear geometries. It is then shown that the well-known Near-field Compensated Higher Order Ambisonics approach is equivalent to the explicit solution for spherical secondary source distributions. The recently proposed Spectral Division Methods is identified as the extension of Near-field Compensated Higher Order Ambisonics to planar and linear secondary source distributions. Apart from the explicit solution, an implicit solution exists, which has become known as Wave Field Synthesis. The latter is derived from the Rayleigh Integral and its modern formulation for arbitrary complex secondary source distributions is outlined. This work deals with the instrumental measurement methods for the perceived quality of transmitted speech. These measures simulate the speech perception process employed by human subjects during auditory experiments. The measure standardized by the International Telecommunication Union (ITU), called “Wideband-Perceptual Speech Quality Evaluation (WB-PESQ)”, is not able to quantify all these perceived characteristics on a unidimensional quality scale, the Mean Opinion Score (MOS) scale. Recent experimental studies showed that subjects make use of several perceptual dimensions to judge about the quality of speech signals. In order to represent the signal at a higher stage of perception, a new model, called “Diagnostic Instrumental Assessment of Listening quality (DIAL)”, has been developed. It includes a perceptual and a cognitive model which simulate the whole quality judgment process. Except for strong discontinuities, DIAL predicts very well speech quality of different speech processing and transmission systems, and it outperforms the WB-PESQ.